There was definitely no time for April foolery at the Glasgow Robertson Trust offices on the 1st April 2016. 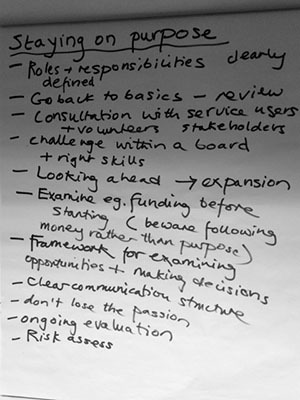 Representatives from 21 Scottish charities had devoted valuable time at the end of their working week to learn more about how they and their Boards could together, secure and improve service provision. There were no practical jokes or hoaxes, there was no need for icebreakers or introductions, all delegates got actively involved in meeting each other, debating and discussing issues, seeking common ground and identifying best practises. Stay Calm, Focused and to Plan. The hum around the room was evidence of fervent discussions around the organisation’s purpose; “to address a common need”, “to survive and guarantee essential services can continue” to align our mission, constitution, communications, plans and deliver against these”. All delegates agreed times are turbulent. The need to stay calm, focused and to plan, are key to organisational sustainability and in many cases, since demand is great, to grow their businesses. The role Trustee Boards need to play and the relationship between CEO and Chair are vital to success. There needs to be transparency and trust between the Board and Operations, as well as clearly defined structures and processes that guide everyone towards their objective outcomes. Constant focus on Purpose is key to consistent and continuous improvement. 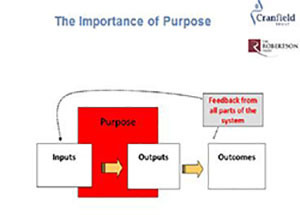 Making sure that the decisions taken by the Board, and Senior Management Team support the Purpose, deliver the correct outcomes without jeopardising quality and timeliness. Of course it’s important to plan for the future but equally important to look back, review and learn from the past: What went well? What didn’t? How can we change? What further information do we need? Can we challenge the status quo or new decisions? Checklist for Board formation and Function. Interview Board Members for their fit and skill set – what will they bring to your Board? Schedule expectation of meetings, reading papers etc. Have processes in place to provide communications, and enabling “challenge"
Have a Declaration of Interests process and register. Communication and Diversity are Key. This was a lively and interactive workshop. All interests were raise and explored in true collaborative style. Overwhelming it was clear that a good communication structure and style are a necessary to engage and influence within the organisation and externally. These skills are critical to an effective, functioning Board, look for them amongst your mix of requirements when selecting Trustees. It’s also worth looking at diversity. Diversity is widely agreed to be a good thing: leading to better decision making, greater innovation , and more competitive and effective organisations. Diversity of Stakeholders: It can be hugely helpful to look at a problem through a different lens, particularly when reviewing or developing services. Length of service: A balance across the board is the ideal with both the wisdom of experience and fresh look. Diversity of skills: lastly but importantly skills – both functional HR, finance, marketing, legal and softer skills of communication, partnership working, acting as an ambassador for your organisation. Are there written role descriptions for trustees/board members? Have all board members had an induction pack that includes details of the role of Trustees outlined in the 2005 Act? How frequently does the Board meet? Is it often enough? 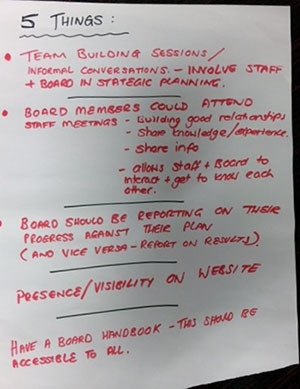 Is there an annual calendar of Board meetings, setting out the priorities for particular meetings, the timing of reports from any sub-committees and the relationship to any external events or meetings? Are there clear expectations for the production and circulation of papers, agenda-setting and distribution of minutes, so that Board members can read papers and prepare for meeting in advance? Is there a robust search process to identify suitable Board members? Is there a good selection process with criteria, related to the role description and Board requirements? Are there clear expectations of attendance at Board meetings? What happens if there is poor attendance? Is the organisation explicit about the limitations of 'shadow trustees' and who may remove or replace such attendees at meetings? Are there succession plans in place for Board members, Chair and officers? Does the Board regularly review itself and its activities? 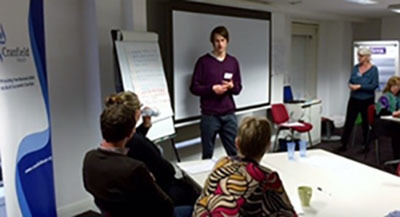 Is training available for Board members individually and as a group? Is there a CEO appraisal schedule and process in place? 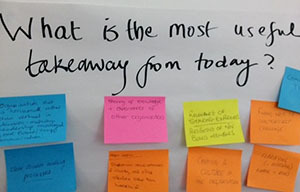 "It's been very useful to hear different people's perspectives and share practices and ideas." "I'm going to take the knowledge from this class to the Board and produce a Board handbook"